For 350 years the story of the Scottish soldiers that were buried in Durham had been passed down for generations without ever knowing where their graves were. This is until the Palace Green Library Café construction began – an archaeologist was on site because of the UNESCO title, but didn’t expect to unearth (quite literally) two mass graves. Two years later in 2015, the project team were able to conclude that “the only plausible’ explanation was that it had to be the Scottish soldiers from the battle of Dunbar, and the exhibition explains exactly how they got there. What I love about the exhibition is that history and science are presented side by side and showcase exactly how they came to the conclusion that the skeletons were the Scottish soldiers from the battle of Dunbar. The first room of the exhibition focuses on the story of the battle of Dunbar, a little bit about King Charles I and Oliver Cromwell and then the science behind figuring out the story of the skeletons using Radiocarbon dating on the teeth from the skeletons and being able to tell that they were pipe smokers (I am still very impressed about this). The second room focuses on the science of archaeology, for example, how diseases leave imprints on bones to the information that can be extracted from teeth to the use of CT scanning and facial recognition. You can even see a 3D facial reconstruction of what one of the Scottish soldiers possibly looked like – which is pretty astounding! 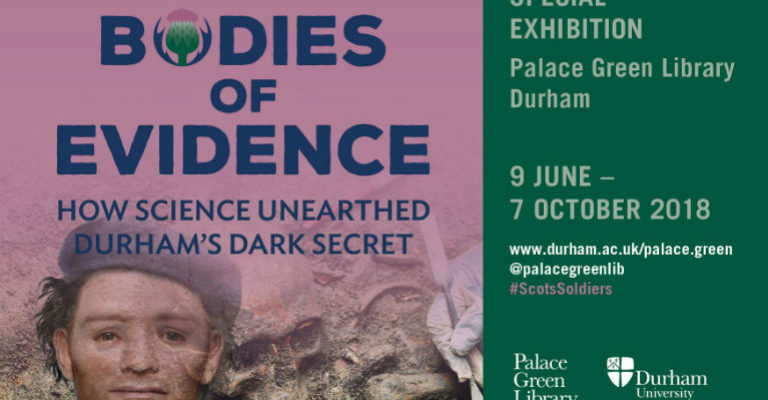 If you have a keen interest in history or science, you will thoroughly enjoy the Bodies of Evidence exhibition, I ended up spending quite a bit longer than I expected reading everything I could – it’s wonderfully set out and at £7.50 a ticket (£6.50 for concessions) it won’t hurt the wallet.